This modern and luxurious house designed by Melbourne's award winning architectural and interior design company, Carr Design, is nestled amongst the lush tropical landscape of Flagstaff Hill, the most prestigious location in one of Australia's premium resort destinations, Port Douglas. With exposed steel structure and vast areas of glass, softened by the extensive use of timber cladding, screens and internal finishes, this house sits openly and unobtrusively in partnership with the raw tropical landscape, blurring the boundaries between outside and in. As it steps down Flagstaff Hill, a boundary of vegetation contains the space, while an exposed, blade-like central spine wall ensures your complete privacy. This hand 'scored' concrete rendered wall brings its rough exterior finish within, to create a strikingly contrasting internal experience. 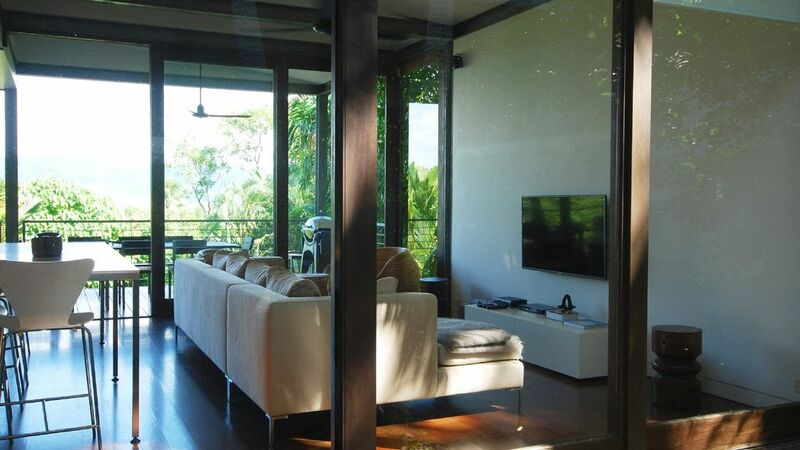 This resort-inspired house allows an open and private encounter with the environment, with 180-degree views of the vastness of Tropical North Queensland while keeping interaction with natural vegetation and wildlife within arm's reach. The entertainment zones provide panoramic views of the, coastal hinterland, and the mountain ranges of the Daintree National Park. The 'wet edge' pool, private courtyard, bedrooms and bathrooms merge together with the surrounding landscape, allowing the tropical micro-climate to be experienced. With bedrooms and bathrooms located on each of the three levels, this four bedroom house creates a perfect retreat for 2 or 3 couples. Positioned a minutes walk from the famous restaurants and beaches of Port Douglas, this fully air-conditioned house also features Foxtel, DVD player, TV and BBQ with outdoor dining area.